I am very late in finishing the July round up, but as always it covers what was happening in July and all picture are from during the month. You can compare with July last year. There was far more rain last year. It was nearly a whole month of hot sunshine without rain, but rain fell in the final few days of the month, there was also some rain on the 16th. I've already shown many of the flowers during the month in previous posts. Most of the following have not been mentioned before. 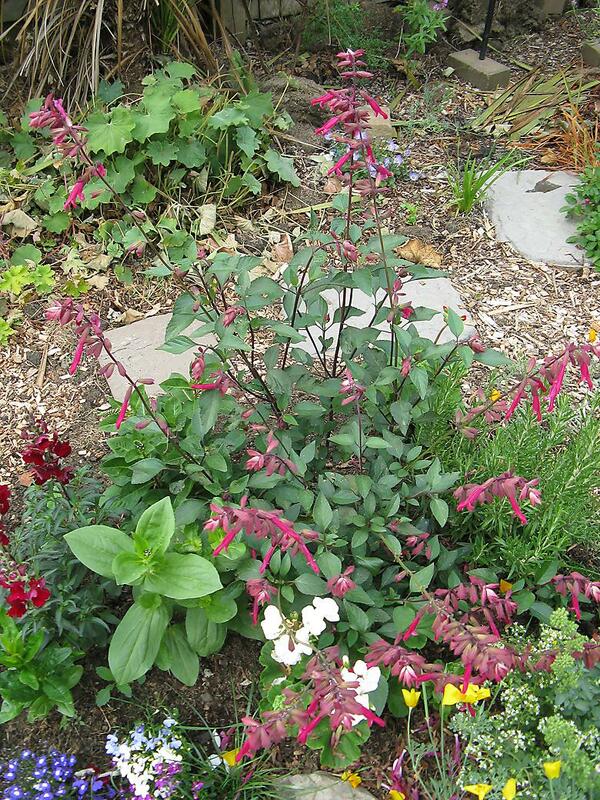 Salvia 'Wendys wish' : I saved this via a cutting over the winter. It has grown much bigger this year and there are lots of flowers. I'm glad that I've now had a chance to see it at its best, but I shall not be saving it for another year, if it dies over the winter (and it most likely will) then that will be that. 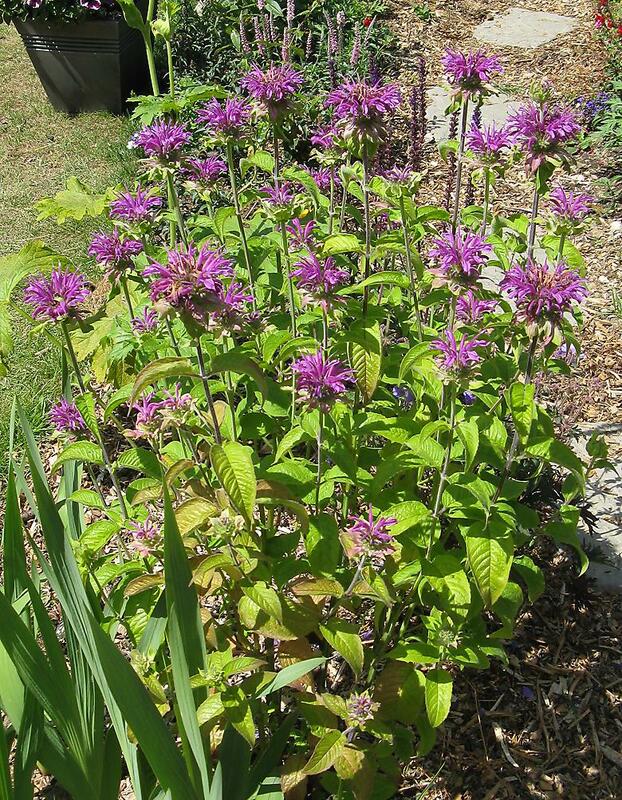 Monarda 'Prairie night' : This was bought at the end of April and has done incredibly well. 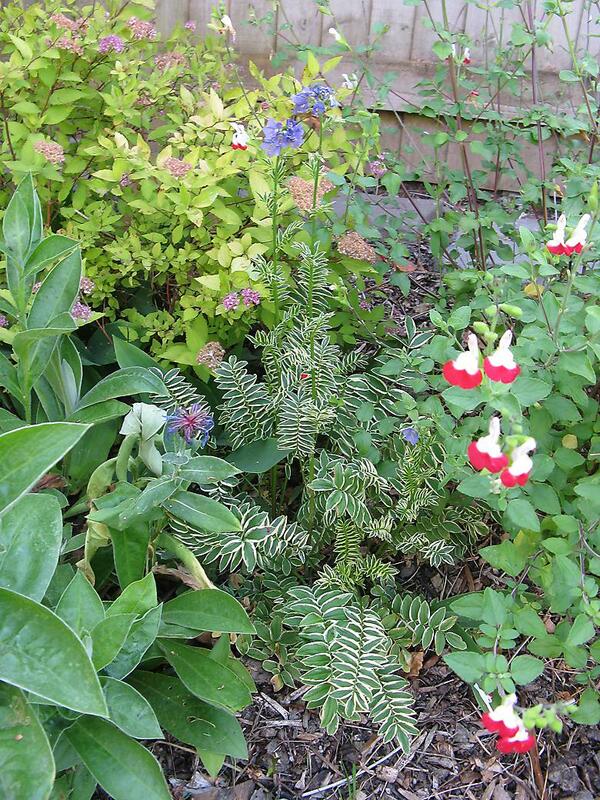 It is also a very sturdy plant and has grown tall without staking, surviving the high winds earlier in the year. Polemoniums : The first is P. caeruleum 'Brise D'Anjou', a variegated variety which is sandwiched between the Centaurea and the Salvia. The second is P. yezonense 'Bressingham Purple'. This has had a bit of a rough time. The cold weather seemed to set it right back and there was only a short about inch long left alive. It may have survived in the ground, but I put it into a pot and later planted it out. It grew a flower spike which was snapped off by the wind just as it was starting to open. It took quite a while until it grew a new flowering stem, but here it is at last. 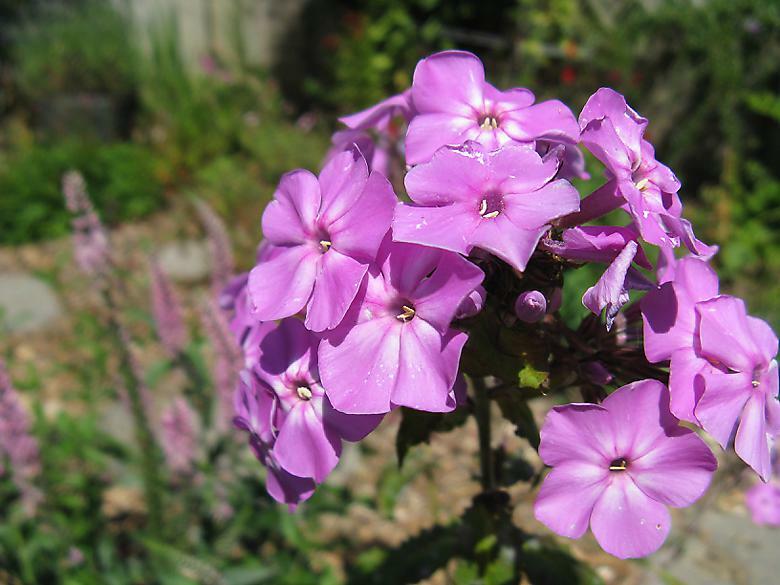 Phlox : This phlox was new this year and quite disappointing. One of its stems was snapped off by the wind immediately after planting and then it suffered badly from mildew. It suffered a bit with the dry weather I think. This is it at its best. I'm not supposed to write about things that happened after the end of the month, so lets just say I wouldn't be surprised if this didn't return next year. 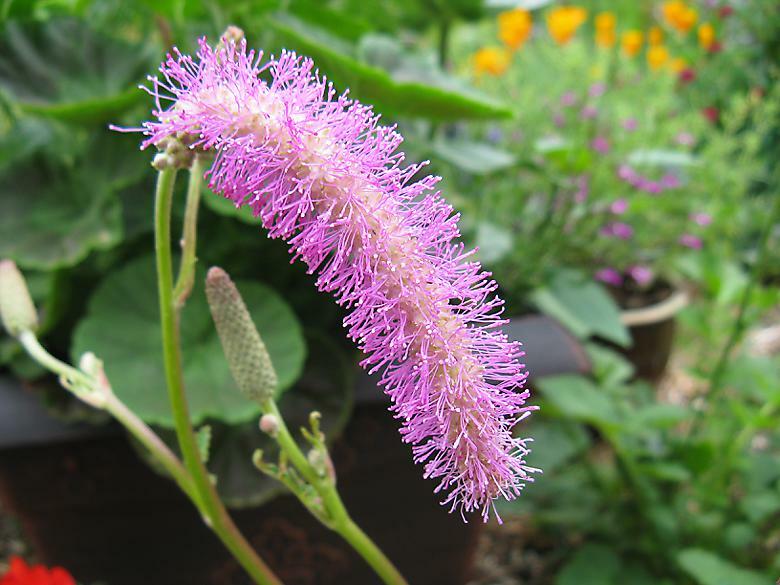 Sanguisorba 'Lilac squirrel' : I've shown this picture before, but don't have any more from the month. There are many buds and they are not all coming out at the same time, so I'm expecting this to be in flower for a while. Astilbe × arendsii 'Ellie' : Bought this year and doing well. It lights up the darker corner quite well. 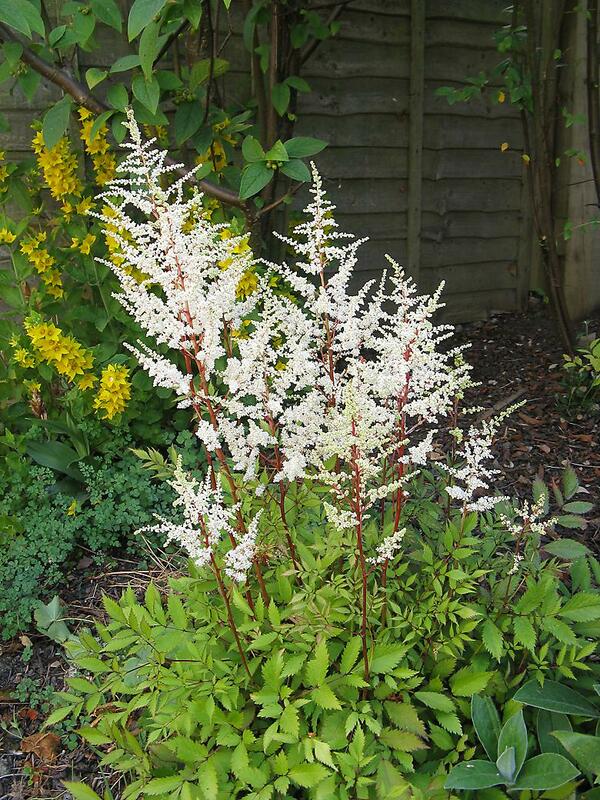 My other Astilbe appears to be a miniature one, which flowered again this year but is no bigger than it was. 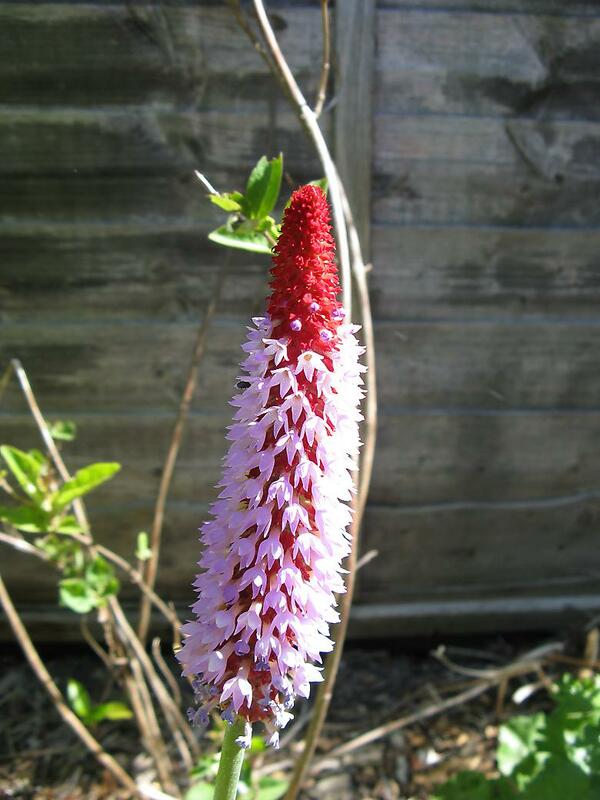 Primula vialii : Bought at the tail end of last year with a single flower, returning this year with about four flowers. 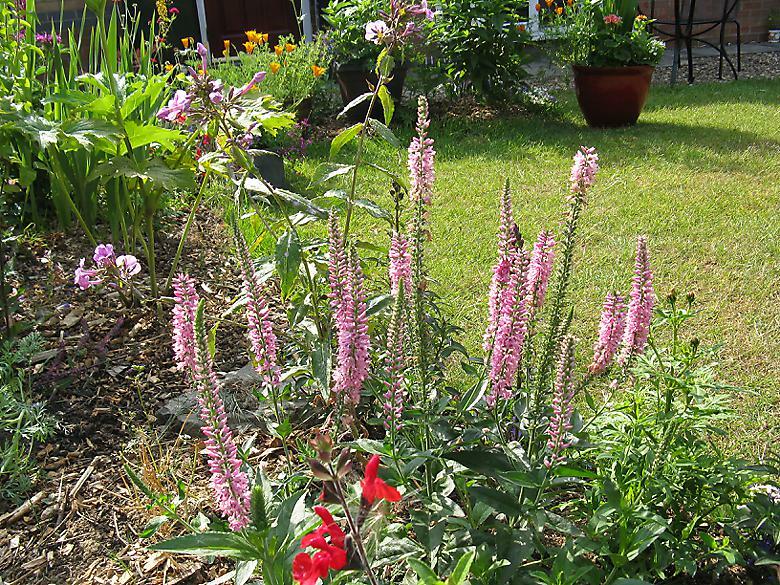 Veronica 'Pink Damask' : This is much taller than my early flowering Veronica. It has had many flowers this year. However it started to suffer a lot from mildew. Lythrum - The flowers of L. 'Robert' died very early perhaps due the very dry weather. My main patch continues to flower at the end of the month. The heavy rains spoiled the flowers at their best. Salvia - Multiple Salvias in flower. Coreopsis - New this year, continues to flower. Monarda - One of the best shows of the month. Sidalcea - The 'William Smith' had a disappointingly short flowering period. I cut it back in the hope of further flowers. The 'Elsie Heugh' and 'Little princess' were as far as I can tell identical. Both started out with frilly edged petals, but later on were more scalloped. Most pictures on the web have 'Elsie Heugh' with frilly edges, whereas 'Little princess' has scalloped edges. But since the flowers change during the season this is not helpful for me in telling them apart. Helenium - The 'El dorado' is almost all yellow. Unfortunately some of the surrounding annuals turned out to be yellow too! It has grown very well - hard to believe that it arrived in a box which was much too small to hold it now, along with 7 other plants! The 'Siesta' is a bit disappointing perhaps due to location, but also it is a smaller flowered variety. The 'Mardi Gras' has been doing well and I like it a lot. Campanula - 'Samantha' has flowered well but hasn't really grown any bigger at all. 'Sarastro' also didn't appear to grow any bigger and had a few very large flowers. I am going to have to investigate why this area of the garden seems to have worse growing conditions. Geranium - Various geraniums in flower. Not really thriving in the dry conditions I think. Sanguisorba - In addition the one above, the 'Tanna' put on a good display again. Lupin - Only on of my Lupins has really grown well, possibly down to location. Knautia - This has been flowering away continuously with no sign of stopping. Alchemilla - Tail end of the flowers. I removed them pretty sharpish as I still have seedlings coming up from before I moved here and I don't want any more! Lobelia - Funny how these were my favorite plants last year, but this year with all the new plants I hardly notice them. Gaillardia - Unfortunately this is surrounded and overgrown by annuals, but is flowering profusely. Geum - I don't think that the dry is suiting them. Lots of leaf growth however. The 'Totally tangerine' has had few flowers since the initial impressive flush is over. Helianthus - Lots of buds, a few flowers. Grown very tall and wide as though it has been there for years, although it is new this year. 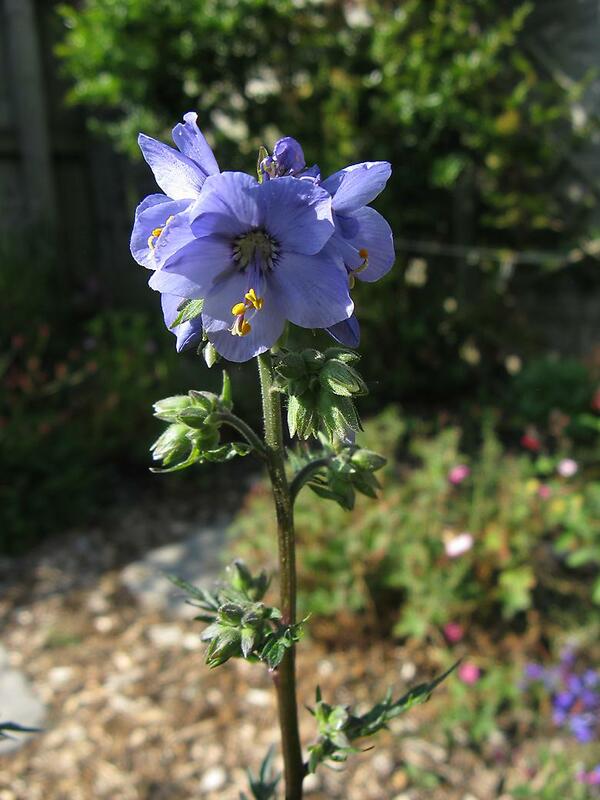 The annuals have really been useful this year to fill in gaps into which the perennials will be expected to grow. The Pelargoniums have been interesting as I planted them all around the garden. Some have hardly grown (but still flowered) and others are a decent size. Down the side of the house, there has been very little growth. This makes sense as nothing really grows well there apart from bulbs. That's all or else it will be September before I get this published!